The LV4000 is the latest customer display introduced by Bematech . The LV4000 is used as a secondary monitor with supported POS software (check with your software vendor for support confirmation) or with Bematech’s easy set up guide, which can be found here. 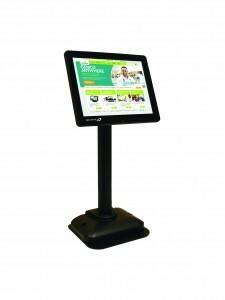 The 8.4″ LCD monitor and can deliver the latest promotion information and even social media messages right from the internet. With a high 600:1 contrast ratio and 800 x 600 optimal resolution, the screen projects vivid graphics to grab customer attention at the POS, enhancing your overall business experience. Creates great up-selling opportunities. High ROI.